Sweet. Savory. Juicy. I can’t think of a more perfect celebration of the summer harvest than homemade roasted red pepper salad. When I was a kid my Mother used to make bowl after bowl of this simply perfect side dish throughout the months of August and September. My family and I always loved it, and always devoured every last bite. So comfortable was I with the process of making homemade roasted red peppers that it wasn’t until my early twenties that I tried the jarred variety. Yuck! They were bitter, slimy, and lacked all of the wonderful sweet and savory flavors that I was accustomed to. To this day I have never bought another jar of roasted red peppers and I cringe every time I’m served strips of them a top a salad or in a sandwich when I’m dining out. For me, homemade roasted red peppers are without a doubt worth the extra effort every time. The truth is, they’re super easy to make, and they can be very inexpensive if you catch a good deal on peppers at the peak of the season. 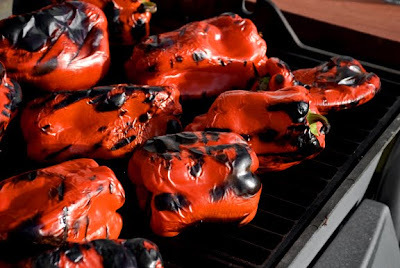 Here are my simple step-by-step instructions for making homemade roasted red peppers. I have also included a quick recipe for a modified version of the red pepper salad I loved so very much as a child. STEP TWO: Turn and rotate the peppers until they are black, charred and blistered on all sides. Surprisingly, they are done when they look totally ruined. 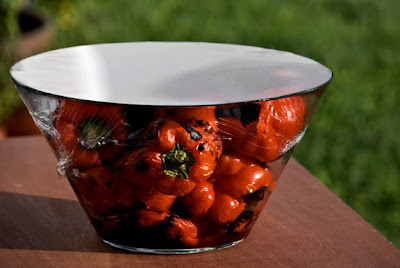 STEP THREE: Transfer the peppers to a glass bowl and immediately cover the bowl with plastic wrap to trap in all of the steam. Allow the peppers to come to room temperature (approx 1 hour). STEP FOUR: Using your hands, remove the skin, seeds, and stems from the peppers. 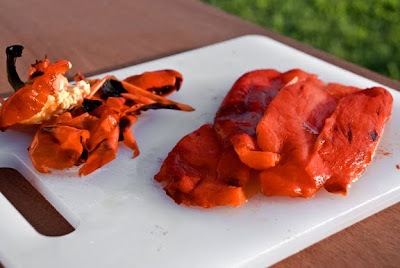 The charred skins will easily slide right off with very little effort. Slice the flesh into one inch strips. Add salt and enjoy as is, or use them in your favorite recipe. In a medium bowl mix together the vinegar, oil, onion, avocado and salt. Allow to marinate for at least 10 minutes. Meanwhile, grill the corn on all sides until the kernels just begin to brown. Remove the corn from the grill and carefully slice off all the kernels. 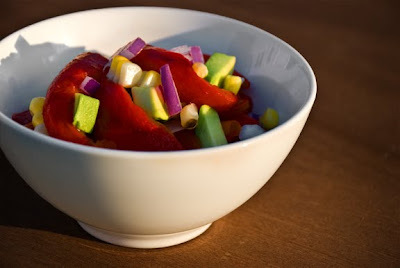 Add the grilled corn kernels and roasted red peppers to the avocado mixture and toss to coat. Season with additional salt and vinegar to taste. This salad is most delicious when enjoyed immediately, but also keeps nicely for lunch the next day. You have totally inspired me to make these! They look absolutely delicious. Last night at Stonehouse I thought of you several times ... the fresh local food, how delicious it was, and the presentation of it all. I had the opposite experience with the same result - always bought jarred until I made my own and never bought jarred again. And there is something perfect about the pairing of sweet corn and roasted peppers that everyone seems to enjoy. Can't wait to try this salad. I'm so happy your remember Melissa! I can't wait to try your recipe. It looks awesome. Nice job. 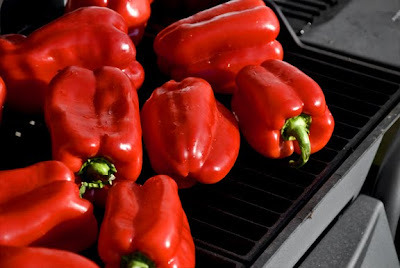 Making your roasted red peppers right now! This is one of my favorites!